Two days ago I posted an article listing the top 5 reasons why E Ink ebook readers are better for reading ebooks than tablets. This article brings an alternate perspective to list the top 5 reasons to get a tablet for ereading instead of a dedicated E Ink ebook reader. As mentioned in the other article, I think ebook readers are better suited for reading ebooks specifically, but there are certain things that tablets are undeniably better at when it comes to ereading as a whole. Here are my top 5 reasons to get a tablet for ereading instead of an E Ink ebook reader. #1. Access to multiple reading apps and stores—the ultimate ereader: The great thing about tablets is they can easily become the ultimate ereader. All the major ebookstores have tablet apps, and there are some great 3rd party reading apps as well. Not to mention news apps, RSS reader apps, comic apps, magazines, and the whole nine yards. Basically there isn’t anything a tablet can’t do when it comes to ereading. Even locked-down tablets like the Nook HD+ can be turned into full-fledged reading tablets with an N2A card. #2. Color screen, larger screen: With a few expensive exceptions, E Ink ebook readers generally have smaller 5 or 6-inch screens, and they don’t have color, just black-and-white. Most tablets have 7 to 10-inch color displays, and the extra screen real estate and color makes a huge difference when reading things like PDFs, comics, magazines, newspapers, and web browsing. E Ink ereaders can handle those too, just not nearly as effectively as a tablet. #3. Extremely crisp and clear text with newer high-resolution displays: One of the great things about newer tablets is the high resolution screens that make text appear super-crisp and clear, even really tiny text. It’s like getting a boost in vision. Stuff you’d normally have to zoom in on is easily readable. Pixels are invisible, viewing angles are incredible, and colors pop off the screen. #4. Better web browsing, web reading: Most E Ink ebook readers have web browsers built-in for downloading ebooks and reading online, but the functionality and usability is often very basic. There’s no question that tablets are far superior for reading online and general web browsing. Some tablets like the Kindle Fire HD even have web-reading mode that removes all the distractions of a web page to leave just the content. #5. Multifunctional, better value: Another benefit with tablets is they are a lot more than a single-use device. In addition to reading they of course can be used for all manner of things, including watching movies, listening to music, playing games, recording videos, doing taxes, and the list goes on and on. That also makes tablets a better value than ebook readers, especially when you consider the fact tablets aren’t very much more expensive than E Ink ebook readers. 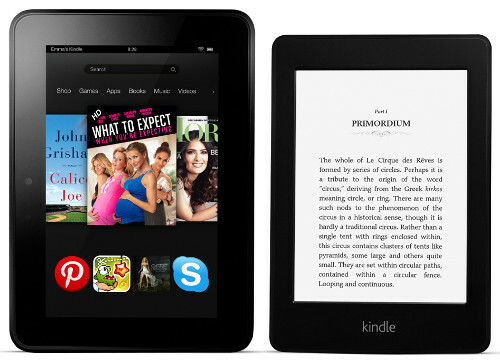 For example, the 3G Kindle Paperwhite without ads is the same price as the 7″ Kindle Fire HD. For most people the latter is going to be the better buy. The best option for those that really like reading is to own both an E Ink ebook reader and a tablet, and with today’s ebook readers costing so much less than they did a few years ago, that’s not a bad option. Granted some of the newer ones like the Kindle Paperwhite 3G are a bit pricey, but a basic Kindle is only $69, and the Nook Touch is on sale right now for $39 and the Kobo Mini for $59. Tablets are a lot cheaper now than they used to be too. You can snag a budget model for well under $100, or a really nice tablet with a high-resolution screen for $200 – $300. Either way you choose to go it’s a great time for ereading, and it will be interesting to see what the future holds. Perhaps a new screen technology like electrowetting displays can bridge the gap to combine the best of E Ink ebook readers and tablets together in a single device. Just be done with it and get one of each… If I’m reading a book and doing nothing else, I generally use my rooted Nook Glowlight. Otherwise, I use my tablet. Not that big of a deal to have two devices for varying purposes. Number one should be in every e-reader, as well as an mp3 player and a headphone output, I like to listen to music while I’m reading, it helps for distractions. Do you think it’s worth buying a 9 inch E-ink reader for reading PDFs? Considering the fact that teir price is still high. Not particularly… tons of PDFs are in color and E-ink no-can-do. That, and the refresh rates aren’t so great. Even the best e-ink PDF experiences have been less than optimal. I’d go the tablet route for that particular need. Get one with at least XGA resolution, and PDF viewing is pretty easy. I personally really like the Nook HD+ with the N2A Jelly Bean mod for this. That 9 inch 3:2 ratio 1920×1280 screen makes magazines, comics, and PDFs really shine. I like my Nexus 7 when we go out. I can check weather, use gps etc. I put the kindle reader on it. I read my Paperwhite in bed. I just sync between the two for reading the same book. Works out great. Of course if I go outside, it’s the paperwhite hands down. And what about the new E-Ink Android-based tablets? What new E-Ink Android-based tablets? Chinese move. Let’s see. Looks promising. Interesting… Thanks for pointing that out, Jotas. I wonder if it can really install apps easily. Booxtor at Onyx is supposedly preparing an update that ports Android 4.0 to at least the M92. I will have fun experimenting with this when it comes out. Ooh, that could be fun, especially with the larger screen. Hey Nathan, I love your comparisons. I am very curious to your opinion which E-reader has the best webbrowser/texting capabilities while reading outside/poolside? Poolside would require an E Ink ereader unless you’ve got an umbrella to shade the sun. And I’ve never heard of one having texting but I imagine it’s possible on a rooted Nook Touch or Sony Reader with the right app. I’d say the Sony PRS-T1 and T2 have the best web browser. The Kindle Paperwhite’s is next in line. It took me a long time to stop waffling and figure out which e-ink reader to buy, about a year ago. Then the higher definition screens and better tablets came along. Now it will be a tablet for me. I would still get an e-ink reader just for comfort reading, but it would have to wait. Hopefully Sony will come out with their own Paperwhite-type of e-reader. Or hopefully the Kindle Paperwhite will have a cheap sale, and someone will show us how to sideload everything on it. Nathan, these two articles are a good idea and I agree with Cloudman above. Come on! breakdown and have both. The e-Ink reader is what you take to the beach and it can do some light web browsing (just no animation stuff though) and you run it off the hotspot in your smart phone. The tablet you use in doors for light reading and the rest of the web stuff so you don’t have to drag out your laptop. And Nathan you forgot the most important tablet application of all, not taxes, but trading stocks! I really don’t get most of these reasons to get a tablet instead of a true e-reader for ereading. What you are saying is that one might get a tablet for ereading because you can also use them to NOT read. It is a bit of a self defeating argument then. Is it not? I expected to be presented with valid reasons for why the ereading experience on a tablet is preferable. Also a very weak reason, because it is comparable to #5. Web browsing is not what current dedicated ereaders are designed for. They are about reading books. Yes, you read text when you browse but that is not what one would call reading compared to reading a book. Also a weak reason. Many modern ereaders are highres. Highres enough to be completely equal to the normal book reading experience. I agree, but color is coming. Also color will not be missed at all when reading novels. But it is true that other uses (books that require color) are limited by current tech. A nonsensical reason. Many brands offer large screens up to 11 or 12 inch. So if you want it you can buy it. But most readers want small devices for good and carefree portability. So larger screens can easily be seen as a negative instead of a positive. Personally I do not want a big screen at all and I know of no fellow e-reader user who prefers an awkward large screen. But if they did they could simply buy an 11″ ereader. The fact that they have not done so is telling. #1. Access to multiple reading apps. Many ereaders feature multiple reading apps. The open system ereader brands can read virtually every format you throw at them. What more could one want? Personally I believe one should never buy into a closed system (Kindle) anyway. I consider a closed system like Kindle’s bordering on the criminal. So to wrap it up. For those who seek a true reading experience, tablets have very little to offer. Especially when one takes into account the actual act of reading books. On a dedicated reader this is a much more pleasant experience. I’m surprised no one has mentioned eye strain. I love my tablet but if I spend a lot of time reading on it I get headaches and eye pain. I don’t get the eye pain or headaches when reading on my Kindle.